Do you ever feel intimidated or uncertain of how to wear different prints and patters? Have you ever wondered how much leopard print is too much? Where do I draw the line with stripes? Well, we’ve got you covered! We’re here to give you the scoop on all things prints and patterns. 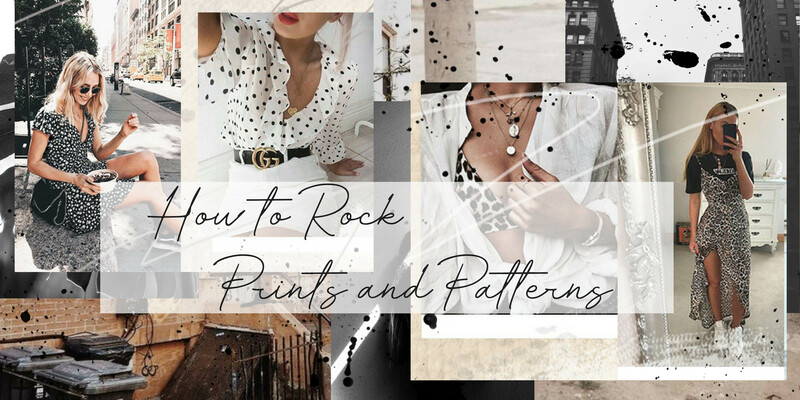 Whether you are feeling bold and fresh, classic and neutral, or trendy and sweet, we’ve got the 411 on how to perfectly style your favorite prints and patterns. Fresh florals: one of our favorite patterns to mix and match! Floral patterns are feminine and flirty, and effortlessly stylish. Bring the summer vacation vibes with you anywhere you go with these fresh floral trends. Pair your fav florals with a classic denim skirt during the day and a sleek midi skirt for a night out, sandals or espadrilles, and simple jewelry to complement your look. Shop some of our favorite floral pieces! Animal prints: talk about wild! Animal prints and patterns go best with a fierce and free spirited attitude, and the excitement of a spontaneous adventure. You’ll be feeling fearless and unstoppable, inspired by the ferocity of a cheetah. Try wearing your favorite animal print as an accessory to your classic neutral pieces, or wear an animal print statement piece with basic heels and earrings to accessorize. Either way, animal print is basically a neutral anyway, right? Shop some of our favorite animal print pieces! Polka dots: whether you’re vintage or preppy, polka dots add a playful touch to your style! The classic polka dot can be worn casually or dressed up for a GNO, whatever you want it to be. Just like you, the polka dot is fun, interesting, and a little bit sassy. Style your polka dots with coordinating solid colors and daring heels! Shop some of our favorite polka dot pieces! Stripes: a classic, go to staple in our closets! Basically, you can never go wrong with bold and daring stripes. From business to beach to city to concerts, stripes are always a good idea. For more of a vintage or boho vibe, look for stripes that are wide, faded, and vertical. Pair your striped top with distressed jeans, or your striped skirts or wide-leg pants with a solid crop or tie-top. Accessorize with a statement hat or bag and you’ll be styling! Shop some of our favorite striped pieces! Mix & Match: let your personality shine! Find what prints and patterns you love and are attracted to, and don’t be afraid to combine them. You’re one-of-a-kind, so show it off! This entry was posted in BitterSweet, Blog, Fashion and tagged bittersweet, BitterSweet Blog, bittersweet boutique, Fashion Blog, Fashion Boutique, How to Blog, Prints and Patterns.